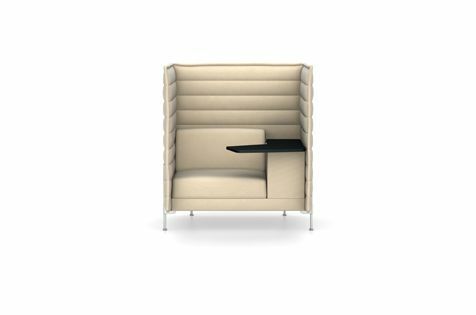 The fundamental idea behind the Alcove product family – providing places of shelter and seclusion – also applies to Alcove Highback Work: the sofa shields users both visually and acoustically from the surrounding environment, forming a space for withdrawal. With its integrated tablet desk, storage box and cable inlet, Alcove Highback Work is a sofa version that offers a flexible and private workspace in the open-plan office for individual tasks requiring concentration. High back and side panels form a visual and acoustic shield, integrated MDF boards for structural support, panel sections connected with zip fasteners. MDF carcass covered in polyurethane foam. Two bonded MDF panels, covered in leather.